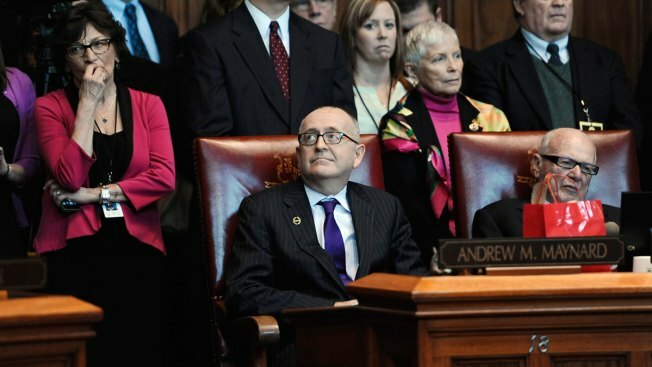 Connecticut state Sen. Andrew Maynard, center, sits in Senate Chambers at the state Capital before he is sworn in for his second term, Wednesday, Jan. 7, 2015, in Hartford, Conn. Senator Andrew Maynard was involved in a one-car accident on Route 32 in Waterford in January, his office announced. Maynard is conscious and undergoing evaluation at an area hospital. After participating in a caucus with his Senate colleagues at the Capitol, the senator was involved in the crash. The lawmaker was badly hurt in July 2014 when he fell from an outdoor staircase at his home in Stonington, hitting his head. He was then re-elected in November 2014 against a Republican challenger. Maynard underwent physical and occupational therapy to work on his balance, strengthen his right arm and improve the use of his right hand, according to a statement that came out at the time of the incident. Note: A prior version of the story said Maynard was hurt in a fall in July 2015.